The original John Reed was a dashing young man from Portland who knew a good story when he found one, and, when he found himself in the midst of the Bolshevik revolution, wrote a book called "Ten Days That Shook the World" and made himself a famous journalist. He never quite got it right again after that. He became embroiled in the American left-wing politics of the 1920s, participated in fights between factions of the Socialist Party and the new American Communist Party, and finally returned to Moscow on a series of noble fool's errands that led up, one way or another, to his death from tuberculosis and kidney failure in a Russian hospital. He is the only American buried within the Kremlin walls. That is Reed's story in a nutshell. But if you look a little more deeply you find a man who was more than a political creature. He was also a man who wanted to be where the action was, a radical young intellectual who was in the middle of everything in the years after World War I, when Greenwich Village was in a creative ferment and American society seemed, for a brief moment, to be overturning itself. It is that personal, human John Reed that Warren Beatty's "Reds" takes as its subject, although there is a lot, and maybe too much, of the political John Reed as well. The movie never succeeds in convincing us that the feuds between the American socialist parties were much more than personality conflicts and ego-bruisings, so audiences can hardly be expected to care which faction is "the" American party of the left. What audiences can, and possibly will, care about, however, is a traditional Hollywood romantic epic, a love story written on the canvas of history, as they used to say in the ads. And "Reds" provides that with glorious romanticism, surprising intelligence, and a consistent wit. It is the thinking man's "Doctor Zhivago," told from the other side, of course. The love story stars Warren Beatty and Diane Keaton, who might seem just a tad unlikely as casting choices, but who are immediately engaging and then grow into solid, plausible people on the screen. Keaton is a particular surprise. I had somehow gotten into the habit of expecting her to be a touchy New Yorker, sweet, scared, and intellectual. Here, as a Portland dentist's wife who runs away with John Reed and eventually follows him halfway around the world, through blizzards and prisons and across icy steppes, she is just what she needs to be: plucky, healthy, exasperated, loyal, and funny. Beatty, as John Reed, is also surprising. I expected him to play Reed as a serious, noble, heroic man for all seasons, and so he does, sometimes. But there is in Warren Beatty's screen persona a persistent irony, a way of kidding his own seriousness, that takes the edge off a potentially pretentious character and makes him into one of God's fools. Beatty plays Reed but does not beatify him: He permits the silliness and boyishness to coexist with the self-conscious historical mission. The action in the movie takes Reed to Russia and back again to Portland, and off again with Louise Bryant (Keaton), and then there is a lengthy pause in Greenwich Village and time enough for Louise to have a sad little love affair with the morosely alcoholic playwright Eugene O'Neill (Jack Nicholson). Then there are other missions to Moscow, and heated political debates in New York basements, and at one point I'm afraid I entirely lost track of exactly why Reed was running behind a horsecart in the middle of some forgotten battle in an obscure backwater of the Russian empire. The fact is, Reed's motivation from moment to moment is not the point of the picture. The point is that a revolution is happening, human societies are being swept aside, a new class is in control -- or so it seems -- and for an insatiably curious young man, that is exhilarating, and it is enough. The heart of the film is in the relationship between Reed and Bryant. There is an interesting attempt to consider her problems as well as his. She leaves Portland because she is sick unto death of small talk. She wants to get involved in politics, in art, in what's happening: She is so inexorably drawn to Greenwich Village that if Reed had not taken her there, she might have gone on her own. If she was a radical in Portland, however, she is an Oregonian in the Village, and she cannot compete conversationally with such experienced fast-talkers as the anarchist Emma Goldman (Maureen Stapleton). In fact, no one seems to listen to her or pay much heed, except for sad Eugene O'Neill, who is brave enough to love her but not smart enough to keep it to himself. The ways in which she edges toward O'Neill, and then loyally returns to Reed, create an emotional density around her character that makes it really mean something when she and Reed embrace at last in a wonderful tear-jerking scene in the Russian train station. The whole movie finally comes down to the fact that the characters matter to us. Beatty may be fascinated by the ins and outs of American left-wing politics sixty years ago, but he is not so idealistic as to believe an American mass audience can be inspired to care as deeply. So he gives us people. And they are seen here with such warmth and affection that we sense new dimensions not only in Beatty and Keaton, but especially in Nicholson. In "Reds," understating his desire, apologizing for his passion, hanging around Louise, handing her a poem, throwing her out of his life, he is quieter but much more passionate than in the overwrought "The Postman Always Rings Twice." 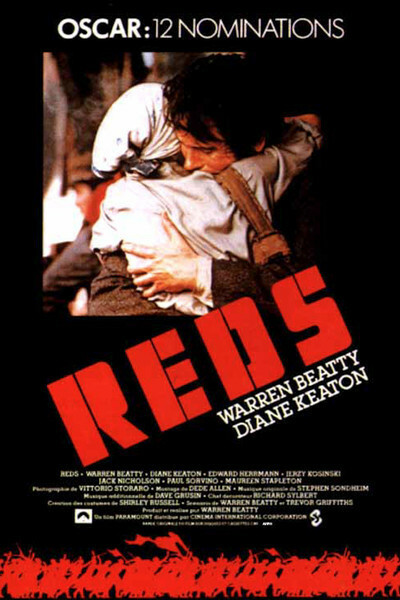 As for Beatty, "Reds" is his bravura turn. He got the idea, nurtured it for a decade, found the financing, wrote most of the script, produced, and directed and starred and still found enough artistic detachment to make his Reed into a flawed, fascinating enigma instead of a boring archetypal hero. I liked this movie. I felt a real fondness for it. It was quite a subject to spring on the capitalist Hollywood movie system, and maybe only Beatty could have raised $35 million to make a movie about a man who hated millionaires. I noticed, here at the end of the credits, a wonderful line that reads: Copyright copy MCMLXXXI Barclays Mercantile Industrial Finance Limited. John Reed would have loved that.